Reasons for concern: This deep-rooted, aggressive and vigorous species can quickly take over disturbed and unattended areas, and outcompete native species, reducing plant diversity and wildlife habitat. It can form huge monocultures and is very difficult to eradicate. Dried dense populations can be a significant fire hazard. 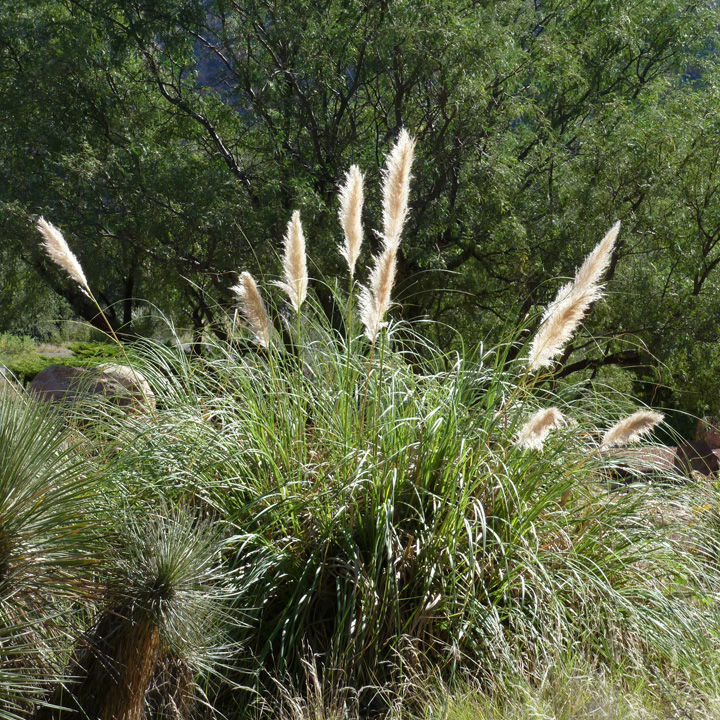 Botanical description: Large, erect, densely tufted grass with white to violet male plumes or white female plumes 1 to 3 feet long. Plants are either male or female. Leaves: Leaf blades can grow up to 6 ft. long and 1-3 in. wide. They are V-shaped in cross-section, and bluish green in color. Upper surface is smooth at base. Lower surface may be smooth or hairy towards collar. Leaf tips are bristly and curled, and margins are rough and sharp. There are rarely hairs on leaves as there is with ravenna grass. Stem(s): Stiff stems grow 6 to 14 feet tall. Flowers: Showy, silvery-white, feathery inflorescence up to 4 feet in length. Seed heads: Showy plumes of seeds are 1 to 4 feet long. 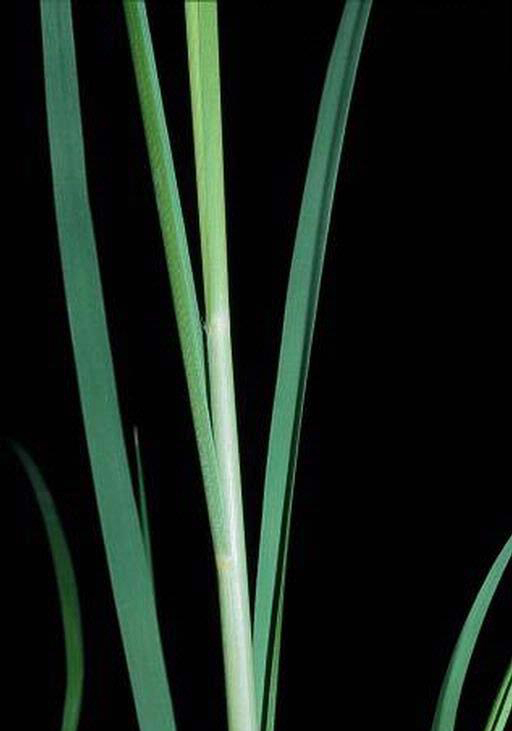 Develops seed only when male and female plants are within pollination range of each other. Lightweight seed can disperse by wind up to 20 miles. Each plant can produce up to 100,000 short-lived seeds. A seedbank does not establish. Roots: Dense fibrous roots grow from shallow short lateral rhizomes, which spread to 20 feet or more and grow to a depth of 11 feet. Roots of a single plant can occupy a soil area of about 1,100 square feet. Native to: Chile, Argentina, Uruguay and southern Brazil. Introduced in Ohio in the 20th Century and by 2001 had reached the Southwest. Introduced for erosion control and very popular in Arizona as an ornamental. Where it grows: Northern Coconino County, including Glen Canyon National Recreation Area. Yavapai, Maricopa and Pima counties. In bare, sandy soil. Disturbed areas, dunes, bluffs, roadsides. On sunny, moist sites or where seedlings can compete with grasses or sedges. Tolerates a wide range of climate variation. Reproduction: By seed and root fragments, which can develop shoots at base of plant. Weedy characteristics: Establishes monocultures quickly and control is very difficult. Tolerates moderate drought. Prolific seed producer. Re-sprouts prolifically. Can live up to 15 or 20 years. Control strategies: Contact a professional. Hand pulling or hand grubbing is effective especially on seedlings. Wear protective gloves to protect against sharp leaf edges. For larger plants, hand tools may be needed, maybe even a chain saw to expose the crown or base. Remove entire crown and top section of roots to prevent resprouting. Bag roots and all plant parts because they can re-establish. Always remove and bag plumes before they mature. Never let them go to seed. Monitor plants frequently to remove any new plumes. Heavily mulch bare sites or plant desirable vegetation to reduce seed establishment.